In our system of marketing, you need to be writing. I know you’re thinking, “Ah, I don’t write.” Yes, you do. We have covered that, remember? Ann Handley’s, Everybody Writes? Did you send an email this morning? Are you going to send one later? You’re writing. Anyway, content. It’s not all about you. You might have staff who can do this and then it’s all lovely. Your system will work, your customers will think you’re wonderful, you’ll produce information, you’ll be an authority, and you’ll be an expert. But what can you write about? Do you plan it? 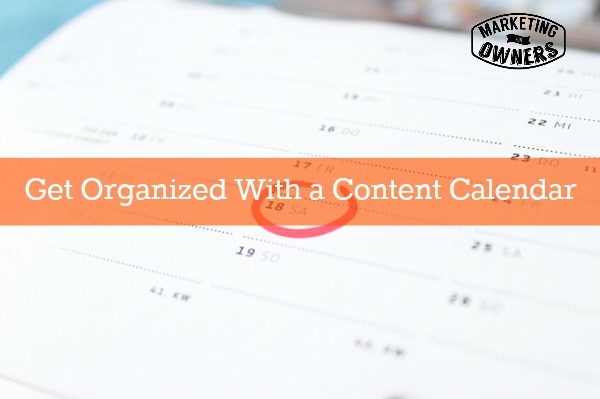 If you put together a content calendar, you can do it for a short period, for a long period or you can do it for the whole year. This will help you formulate your ideas and to put your content into practice. Let me go into some detail. Oh and by the way, good thing about this, once you’ve actually gotten your content calendar going, you can update as you go but when it comes to next year, you’ve already got one. You can either repeat the theme and do different stuff on similar themes or start another one but you have a template or something to work from. Mmm, see? Making life easier. Systems. This is a good one. So, as usual, get your pad and pen because I want you to make notes on this. You will do this in a spreadsheet as it makes it better. 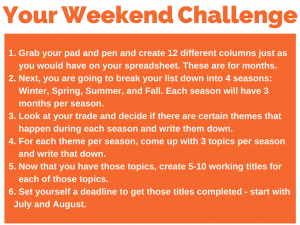 But it’s best for the challenge to write on paper before you put it in as then you can make your adjustments before you put it into your spreadsheet Remember, writing helps. So you’re going to have 12 rows in your spreadsheet. They are for months. Second part, you are going to put them into four seasons. For those of you that have forgotten, winter, spring, summer, autumn or for America, fall! Same thing by the way if anyone didn’t realize. Each season is going to have three months. Then in your trade, in your business, do you have seasons? In your trade is what I mean? So for example, in mine, fire protection trade, when it comes to the spring, campsites, boats, holiday places start to open up and start to look at their protection. For some reason, in September in the autumn schools despite them getting their budgets in April, start to do their thing. Others in the summer, some holidays, people look at putting fire extinguishers in their car for a drive off to Europe, different countries, going out and about, things like that. If you’re an accountant, there’s going to be a tax period. In the UK, there are a couple of times in the tax year. Think to yourself, if you’re a painter, you are going to be decorating outside in the summer, inside in the winter and autumn. If you’re a plumber or heating/ventilation, for some unknown reason, everyone waits till October when they realize it’s cold, their heating needs to work to ask you to do it. So how about reminding them in the summer to get their stuff fixed when you’ve got no work and you can do it more cheaply, that kind of thing. So think of themes and write them down. nother one might be – well you could say no cars and driving. Another one would be going away on holidays considering carbon monoxide safety and that kind of thing when you’re away or if you’re camping. And, another one would be consideration of leaving say fire extinguishers or things under high pressure out in the sunshine and moving them. You’ll come up with something. You’ll be able to come up with something. Once you’ve got those, then create five to ten working titles. What I mean working titles, just a rough title! You can come back to it later. To give you an idea for each theme row, so 12 months, four seasons, three themes per season, five to ten working titles per theme. That means you have if you’ve done it right, you will have five to ten ideas per month, titles per month which means one to two roughly posts written per week. You do not have to do this all in one go. You can start. We are now currently in the middle of June so how about you start with July as the first one and then August? You don’t need to have all those titles for January done today. But allocate some time, get this done. Give yourself a deadline. Say how many you’re going to do per day, which days, yeah, okay. Now once you’ve got all those or if you’re struggling, come back to those working titles. You will have keywords. For example, you’re the plumber or the heating and ventilation person, you’re going to come up with something like, for instance, boiler service, whatever you would call it in your country or in your trade. Go to a site like BuzzSumo or Topsy and enter in your term and it will bring up the more popular titles, and the most popular posts in the whole world index based on those themes. You will see titles. hat means either they have good title structure or they’re writing about stuff that people want to read about because they’re searching. That’s a good thing. Don’t give me the “Oh, but they’ve already written about it.” Everything’s been written about. Whatever I’m talking about, someone’s written about it somewhere lots and lots and lots of times. However, this is the first time you ever heard of it, isn’t it? Hmm. See how it works? Exactly. Old stuff gets out of date and needs updating. Yeah, you get the gist. 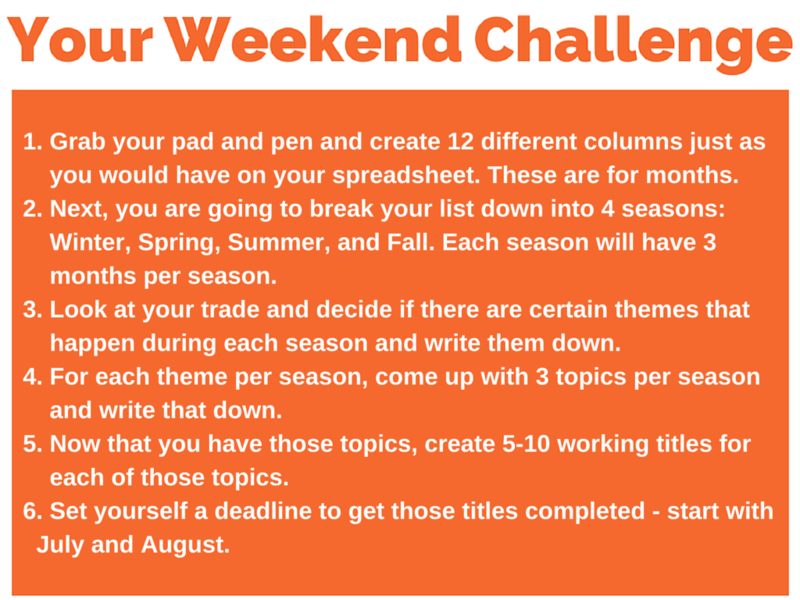 Anyway, that is your weekend challenge. I think that’s enough. I hope this weekend, Saturday and Sunday is going to be as good for you as it is for me. Especially last weekend, we had a blast. We had great fun. We did lots of things. I can’t tell you what they were. They were too good and it would take too long. I hope your weekend’s going to be this good. I look forward to meeting up with you again next week on Monday. Have you started your content calendar yet?